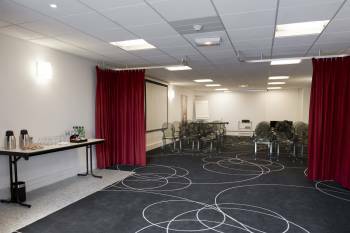 In the heart of Paris, in the vibrant Montparnasse area (15th district), Holiday Inn Paris -Montparnasse Pasteur is the perfect hotel to stay for a business or family trip. Our 4-star hotel offers renovated and spacious rooms, quiet with guidance on garden or street, some even overlooking the Eiffel Tower.A car park of 34 places is available on site. Volontaires & Vaugirard metro stops and Montparnasse sta1on at 900m allows quick and direct access to the main sites of the city: Eiffel Tower, Champs Elysees, Quartier Latin, Saint- Germain-des-Prés, Saint-Lazare, Montmartre, Porte de Versailles Exhibition Centre. Vaugirard Meeting Room : Ideal for all kinds of meetings, business conferences & cocktails, the Salon Vaugirard has a spacious interior of 75 m2 (807 Ft2) and can be adjusted to each particular demand.‣WI-FI internet access‣Welcoming coffee / tea‣Equipment: projector, paperboard, micro, laptop, sound system‣Printing documents‣Cloakroom‣Private ParkingGrenelle Meeting Room : This room of 35 m2 (376 Ft2) is perfect for board meetings or breakout rooms and benefit from natural daylight.